Knol, Google's knowledge sharing service launched last year, has improved with a lot of new features that have gone unnoticed: collections, templates, categories, Google Analytics integration, review scorecards. 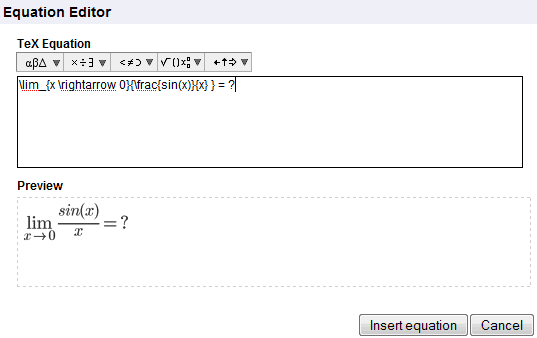 A recent feature added to Knol is a basic equation editor that uses the LaTeX markup language. "This markup language beautifully aligns, sizes and indents mathmatical symbols after they are expressed using a combination of standard letters, words and punctuation characters. The typical LaTeX equation is difficult to read until it is rendered by the typesetting engine that produces an image with the right size, layout and margins that you would expect to see in the equation if it were written in a book. Even though LaTeX can be used to format and markup entire documents, we only support the subset of the LaTeX language that is used to describe mathematical equations and expect that you'll use the standard Knol editor to handle formatting for the rest of your document." The equation editor is not very user-friendly, so it's a good idea to be familiar with LaTeX, but it will hopefully be improved and added to other Google services, like Google Docs. How about \sin for the sine function?